What a treat! 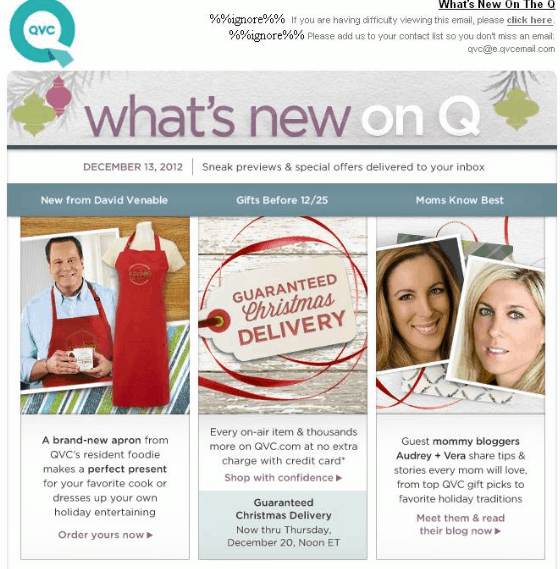 Yesterday we were sent a sneak peek of QVC’s upcoming newsletter featuring me and my partner in crime – Audrey! Getting Gorgeous worked with QVC for a few weeks during this holiday season and this newsletter was an added bonus/ complete surprise. And if I”m being honest… I’m super excited that to the left of our pic is one of David Venable. You KNOW how I feel about that man! I got a free Amazon Prime membership for three months. I remember you posting free ebook for prime members only. How did you find those ebook? I know how to get the top 100 free but not especially for prime members. I’m keeping you, your family, & your baby in my daily prayers! Love QVC and I agree David is a doll – congrats ladies!